Tested by some of the most stringent regulators in the world, Triacta meters are renowned for their accuracy and reliability. All of Triacta’s meters are designed to meet the ANSI C12.20 class 0.5 accuracy (+/- 0.5%) specification or better. Triacta GATEWAY meters are designed to meet the same approval standards as our renowned PowerHawk meters — which are CDFA certified, NYPSC listed, Measurement Canada and Maryland PSC approved, and independently verified to ANSI C12.20 Class 0.5 and Philippines ERC Class 0.2. If money changes hands (as with government incentive programs or tenant billing for example) certified meters become a legislated requirement in many jurisdictions and usually must be sealed. Sealing has a couple of requirements. First, the meter must have a verifiable mechanism for calibrating units of measure with a certified energy standard. Second, the meter must have a mechanical means for warding off any tampering of the device. And lastly, any mechanism for upgrading meter firmware must comply with regulator approved methodologies. When considering meters that can be sealed versus meters that can’t, be sure to consider the possibility of your requirements changing in the future. The trend in most global jurisdictions is towards regulated meters as a primary tool for energy management — as sealing ensures accuracy and integrity. All Triacta meters can be sealed and have both the mechanical apparatus and the built-in software capabilities to comply with regulatory requirements. The Triacta GATEWAY family of meters and data acquisition devices is built on a flexible, modular design that can accommodate from 12 to 48 inputs for measuring electricity and monitoring other building services (such as water or natural gas). Inputs are selectable in increments of 12, meaning you can customize the meter to precisely fit your specific needs. Commercial grade metering, revenue grade metering, pulse data collection, and building automation can all be combined in one box — simplifying installation, with the potential to save significant money on metering equipment and labour costs. Multi-point meters typically feature a uniform configuration (1-phase; 2-phase; 3-Phase), which is suitable for 80% of applications where there are a high number of uniform meter points, such as suite metering or data centres. But for meters deployed in commercial buildings, or for use in measurement and verification (M&V) or energy management applications, often a mix of meter configurations is required. Having two separate meters in these cases adds unnecessary costs. That’s where the Triacta GATEWAY™ system comes in. 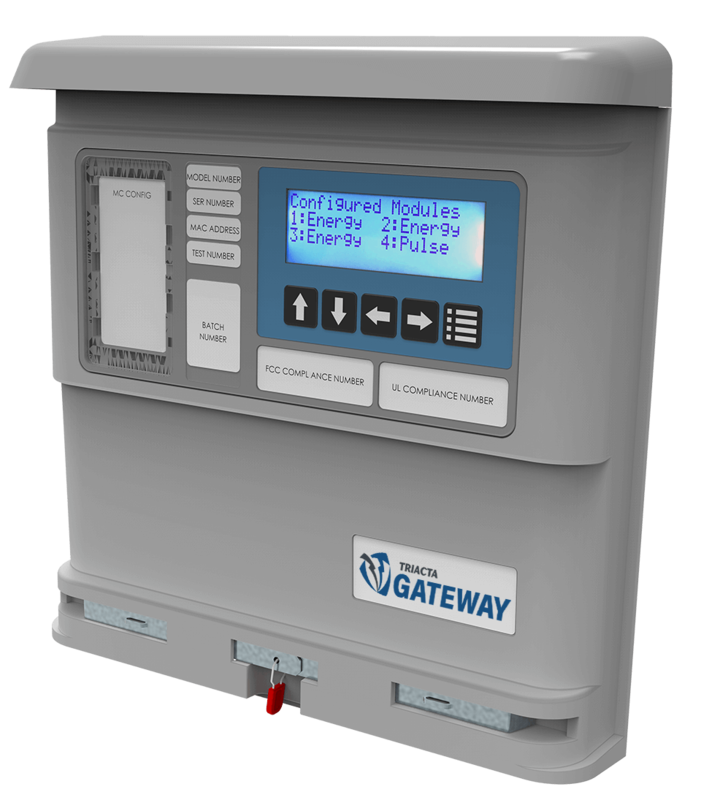 Triacta GATEWAY allows you to create any mix of 3-phase, 2-phase or 1-phase meter points — and any element can be assigned to any meter-point. Now property managers and building owners can can be 100% efficient in their use of available metering assets — and fix any conceivable wiring error, remotely and programmatically. Triacta GATEWAY’s flexible configuration capabilities can save from 30-50% in meter deployment costs. With the Triacta GATEWAY™ system and it’s multi-homing capabilities, all information can be pushed to multiple web services (energy billing, analytics, EnergyStar reporting, demand response programs, meter management, etc. ), so you can take full advantage of as many different web services as you like — without restriction and without having to choose a single provider. It’s your data after all. The free and unobstructed flow of building services information to all stakeholders, systems, and applications should be the goal of any energy management system — so the right information gets to the right place, at the right time. Triacta’s meters are web-centric devices with collectors built-in, so there’s no need for additional proprietary on premises collector systems. And all Triacta products have multiple internet and BAS protocols built-in, so communicating with cloud-based servers or building automation systems is a snap. Triacta’s "Triacta Cloud" Software as a Service is the default destination, which can distribute information to other cloud-based applications, but the destination is programmable. Push only reporting is fire-wall friendly, avoiding IT department complications. With push, all communications are initiated by the meter from within the firewall. Typically a multi-point meter is associated with a particular distribution panel and these panels are usually fed from only one transformer. There are times, however, when you wish you didn’t have to go out and buy another meter to manage that other panel, which is fed from a different voltage reference. The Triacta GATEWAY™ system solves this problem. You can feed 2 voltage references to the Triacta GATEWAY system. With the Triacta GATEWAY meter you can create a meter-point from any element inputs, and you can assign any phase to those elements. That phase assignment can come from either one of 2 voltage references. Dual voltage reference facilitates a more efficient meter-point utilization and can, in some instances, more than halve the number of meters needed to be deployed. Dual voltage reference facilitates a more efficient meter-point utilization and can, in some instances, more than halve the number of meters needed to be deployed. WIFI is becoming almost ubiquitous in modern buildings. It is hard to find a commercial building that does not have a WIFI network in it, or somebody without a WIFI equipped handheld device. The Triacta GATEWAY can use the WIFI network to send its information to the cloud and as a local access to the meter via a mobile device (with the Meter in WIFI Access Point mode). Now meters can be accessed directly by craftsmen and technicians from their smart phones —without the clumsy requirement of using a computer or needing access to the local network that the Triacta GATEWAY may be connected to. And if a WIFI network is not already in place, it is very easy to establish one using the meters themselves. Information from meters needs to be available at all times and to anyone with the need and authorization to know. Many of today’s multi-tenant metering systems, however, manage to get in the way of meter set-up and information flow rather than facilitate it. Managed through onsite meter management systems, proprietary gateways, or dedicated server-based applications, these systems put in place unnecessary obstacles and costs to information flow. Triacta uses a cloud-based approach to meter management. Cloud-based technologies offer the most reliable, safe, secure, and proven way to collect and share data. With the included Triacta Cloud software, there are no distracting set-up issues or deployment costs, no software licensing fees, and no additional hardware to buy. Triacta Cloud offers powerful meter management capabilities. Meters can be programmed on site or remotely. Once programmed, Triacta Cloud's extensive set of management tools allow operators to easily monitor meter operation and receive notification of extraordinary events. Using Triacta Cloud, any energy stakeholder can also distill meaningful information from electricity, gas, water and BTU meters to pinpoint savings opportunities, create an accurate picture of a building’s carbon footprint and identify failing equipment and expensive peak demand charges. Each Triacta GATEWAY system consists of a Triacta GATEWAY Enclosure and a Triacta GATEWAY “Meter Head”. The Triacta GATEWAY Enclosure can be installed on the wall and termination boards can be attached easily after CT’s have been connected (or CT’s can be connected with the Triacta GATEWAY Enclosure on the wall). Each termination board has a shorting connector that automatically shorts the CT’s when the Triacta GATEWAY Meter Head is removed (a standards-based safety measure), and opens the short when the Triacta GATEWAY Head is installed. Power can also be terminated on the Triacta GATEWAY Enclosure at installation. After the Triacta GATEWAY Enclosure is mounted and power and probes are terminated, a Triacta GATEWAY Head can be installed at a later time. In new construction, this prevents expensive systems from being left unattended and unsecured while being wired properly by construction teams. CT’s are automatically shorted when no TriactaGATEWAY Head is present (a regulated safety measure). Termination boards can be simple screw strips, spring loaded, insulation displacement, or over-molded connector pre-wired varieties. In sealed metering applications, the Triacta GATEWAY can be easily (and safely) removed for meter re-verification, with no interruption in building service. While the easy flow of building information is critical for tenant billing and energy management programs, it’s equally critical that the right information gets to the right people — in a secure and safe manner. The Triacta GATEWAY has full HTTPS encryption with automatic security updates, so your data remains YOUR data. Additionally, the Triacta GATEWAY has full Linux authorization and permission enforcement for different classes of users. Only those with the need and permission to access the meter can do so — whether via our Triacta Cloud software, other cloud-based services, or on-site by a technician. Only those with the need and permission to access the meter can do so — whether via Triacta Cloud, other cloud-based services, or on-site by a technician. Tomorrow’s energy management world will look different than today’s, and property managers and owners need to future-proof their building’s infrastructure so it can thrive in both worlds. Triacta GATEWAY features a powerful, upgradable Linux operating system for developing local applications (building automation, diagnostics, business rules) to meet current and future energy management and building automation needs. As new protocols and applications are developed, the Triacta GATEWAY can be easily updated to handle them. Each Triacta GATEWAY meter board has its own metrology processor and the Triacta GATEWAY can change system information without affecting meter calibration. This allows system firmware upgrades to happen “under the seal” as per European and Canadian regulations. When meters are installed in a building they typically establish an internet access point for the electrical metering — often when there is no other such network in place. If there is no expansion capability in the meter for other instruments to piggy-back on, you may have to create a parallel system to access this new information — costing you time, money and efficiency. The Triacta GATEWAY system has an external comms connector (outside the sealed cover of the system) that allows multiple types of external communications boards to be designed for the system; everywhere from daisy-chained ethernet bridge to mesh RF networking to cell-modem. This is a future-proofed system architecture that allows a Triacta GATEWAY system to expand by installing incremental networking that can tether another meter’s instrumentation to the Triacta GATEWAY using BAS or Internet of Things (IoT) protocols. All easily built on your existing investment.